Middle Georgia State University's first master's degree students were among those to receive diplomas at fall 2016 graduation on Thursday, Dec. 15, at the Recreation and Wellness Center on the Macon Campus. Nearly 500 total candidates for graduation, including 10 master's program students, completed degree requirements at the end of fall semester. The majority of graduates earned bachelor's degrees. Two separate ceremonies took place. The first was at 10 a.m. Thursday, Dec. 15, for students graduating from programs offered through the College of Arts & Sciences and the School of Education. The 3 p.m. Thursday, Dec. 15, ceremony was for students graduating from programs offered through the School of Aviation, School of Business, School of Health Sciences, School of Information Technology and Graduate Studies. "This fall's graduation is a historic event for Middle Georgia State University," said Dr. Christopher Blake, MGA's president. "The University launched its first master's degrees one short year ago, and 10 members of the inaugural graduate studies class have already completed requirements. It will be an honor to hand diplomas to those who have chosen to participate in the graduation ceremony." MGA, which became a university in July 2015, currently offers graduate programs in Information Technology and Nursing, with other programs under development. The University's first candidates for graduation from a graduate program are all pursuing the Master of Science in Information Technology. 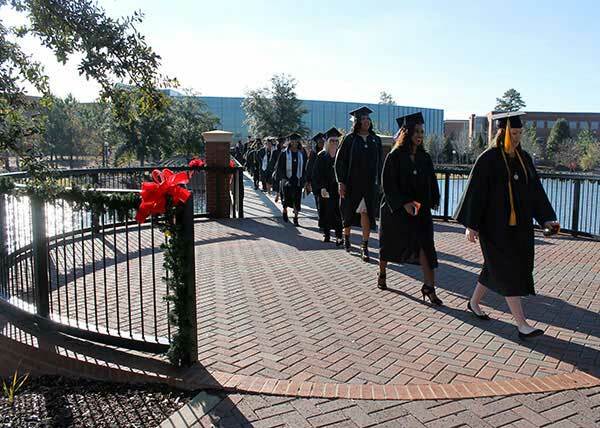 Continuing a tradition begun at spring 2016 graduation, all candidates for graduation proceeded across the bridge spanning the campus lake as they made their way to the Recreation and Wellness Center. Faculty greeted the students as they walk by. The commencement speaker for the 10 a.m. ceremony was Georgia Sen. John F. Kennedy, who represents District 18, which includes Crawford, Monroe, Peach and Upson counties, as well as portions of Bibb and Houston. Kennedy currently serves as a Senate Floor Leader for Gov. Nathan Deal. Near the end of his first term, Kennedy was elected to serve as Majority Caucus Chairman for the 2017-2018 Session. He was named Freshman Legislator of the Year in 2015 by the Georgia Chamber of Commerce. In 2013, Georgia’s Speaker of the House of Representatives David Ralston appointed Kennedy to serve on the Immigration Enforcement Review Board. Kennedy earned a degree in economics from Mercer University in 1987, and he completed his law degree at Mercer’s Walter F. George School of Law in 1990. The 3 p.m. commencement speaker was Superior Court Judge Verda M. Colvin of the Macon Judicial Circuit, which serves Macon-Bibb, Crawford and Peach counties. Appointed by Gov. Nathan Deal in 2014, she is the first African American female appointed to the Macon Judicial Circuit. Colvin received her B.A. degree from Sweet Briar College in Virginia and her J.D. from the University of Georgia School of Law. Prior to her appointment, she was an assistant U.S. attorney in the Middle District of Georgia where in her 15 years of service she prosecuted a wide range of offenses from drug trafficking to white collar crime. During her career Colvin has served as an assistant district attorney in Clayton County, Ga., and assistant general counsel at Clarke-Atlanta University. She worked in the solicitor’s office in Athens-Clarke County, Ga., and in private practice. A member of Leadership Macon’s Class of 2010, Colvin received the Robert F. Hatcher Distinguished Alumni Award as a Community Leader in 2015, an honor bestowed by Leadership Macon. This year, she was the Career Women’s Network’s Woman of Achievement, the Douglass Theatre Women’s History Honoree and the NAACP Drum Major for Justice Award recipient. The student speaker at both ceremonies was TeAndre Chantel Dennis, president of Middle Georgia State University’s Student Government Association (SGA), who is a sophomore pursuing a double major in Nursing and Psychology. Originally from Cleveland, Ohio, Dennis graduated from Alpharetta High School in 2014 and enrolled at Middle Georgia State after being impressed with the institution during a campus visit. During her two years at MGA, Dennis has embraced student life, serving on several campus organizations, including Sisters Attaining Self-Success and Black Student Unification. As 2016-2017 SGA president, she represents Middle Georgia State on the University System of Georgia’s (USG) Student Advisory Council and has served as a delegate for both the University and USG at state and national conferences. Speaking on behalf of the MGA Alumni Association's Board of Directors was Macon-Bibb County Fire Chief Marvin M. Riggins, Class of 1998.